Fresh wounds from amputation surgery can become infected. Using the antibacterial version of the Orfitrans™ Stiff material as a temporary socket dramatically reduces the amount of bacteria on the socket surface, thereby reducing the risk of bacteria entering the wound. Customers will now be able to get the outstanding performance characteristics of Orfitrans Stiff with the significant benefits of an antibacterial component that will effectively inhibit bacteria growth. 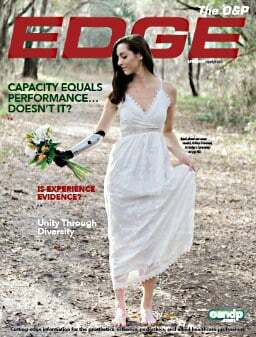 C-Walk® has proven itself with ten years of performance. 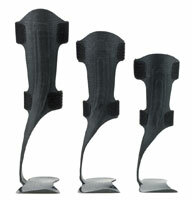 Now through 2008's end, take 10 percent off on this remarkable carbon-fiber foot! 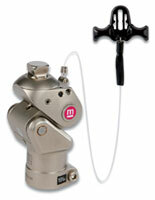 LimbLogic™ VS provides secure, reliable vacuum suspension. Key features are inline mounting, adjustable vacuum from 0 to 20 in-Hg, "set and forget" vacuum monitoring, remote-control operation, water-resistant controller, and quiet operation. For transfemoral applications, accessories are available. The vacuum plate and vacuum pyramid permit relocating LimbLogic VS elsewhere within a prosthesis while maintaining inline mounting. The Alpha® AK Sleeve, featuring Kevlar®-reinforced Alpha gel, aids in creating an airtight seal. A cosmesis kit for cosmetically covering LimbLogic VS is also available. Users have access to ports and controls at the surface of the finished cover. Increase patient referrals and grow your business with the new, free iMarket program. iMarket provides you with marketing literature designed specifically for your facility. Whether they're postcards or trifold brochures, we can personalize your marketing materials, which will help to promote and grow your business. We design it, you print it! South West Orthopedic Designs (SWOD) has created lighter, slimmer, more patient-friendly AFOs with the latest leather-like microfiber. As a liner and/or exterior cover, SWOD Suede wicks away dampness and keeps the foot and ankle cooler. Easy to clean, quick drying, and durable, it is available in beige, black, or brown and can combine with our Birdeye Knit fabric. SWOD offers various ankle gauntlets with carbon fiber technology and a selection of colors and closures, including the 7-in. Sundance, the 9-in. standard (pictured), and an AFO height. Free shipping and five- to seven-day turnaround. 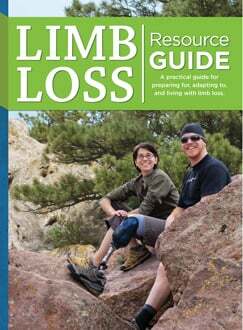 All transfemoral amputees can now appreciate why transtibial amputees are so taken with the new Iceross Seal-In X5 liner, which doesn't require troublesome donning procedures, yet results in an airtight seal that conforms to the residual limb and the internal socket wall. This proprietary design with five incorporated seals ensures firm, pure suction, allowing for unprecedented function without sacrificing stability, comfort, or skin health. The integrated full-length matrix supports the seals during donning to prevent elongation of the distal tissue, while maintaining step-in-and-go convenience. No more sacrificing comfort, time, and convenience for increased suspension! Advance Footwear encompasses a complete range of footwear from the new Advance Walking Comfort Footwear line to the original Advance Orthopedic and Advance Comfort Footwear lines. SoleTech has engineered these innovative shoes to offer features and benefits that are unequaled depth, roominess, and style. The Ortho Remedy Inc. is introducing new colors to its line of ultrasonically welded AFO pads. 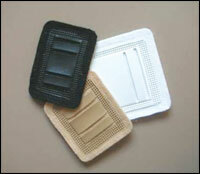 These popular, sturdy pads will now be available in white, beige, and black. Welded pads are typically stronger and more durable than stitched. The newer, modern look also appeals to patients. Sizes include 1 in., 1½in., and 2 in. The pads are sold in packets of ten. Call for a sample. KiddieGAIT™ is an engineered composite frame with anterior shell, lateral strut, and an energy-reflecting footplate with open calcaneus, all designed to allow customization of the frame into a ground-reaction AFO or a partial-foot prosthesis. The energy-reflecting properties of this system reduce the amount of energy required to lift and move the foot forward. Weighing in at only 12.5 oz., Dycors Dynamic Response Extra ADL "E" Foot is ideal for wearers who require more stability than a flexible keel with articulated ankle, and where resiliency is preferred. The optional aggressive gait management (AGM) torque absorber provides appropriate yield and return for moderate-level extra-ambulatory activity. Available in uni, bi, or triaxial with low (½-1 in.) and medium (1-1½ in.) heel-height options. Weight includes an integrated EVA foot shell. Titanium option available. Weighing only 25 oz. with a high-strength keel and polyure-thane structural body, the Z-Axis provides superior control, loading, leverage, and "feel" on the rock. Lightweight, comfortable, and easy to get on and off, the new Unloader® One knee brace from Ossur has been completely redesigned to offer the ultimate in pain relief for osteoarthritis (OA) sufferers. It has 30 to 50 percent more unloading power than the original, with only half the weight. Even patients with arthritic hands will find the brace easier to apply. Clinically proven dynamic three-point force system. Lightweight, perforated frame for flexibility and ventilation. Quick-fit buckles with leverage arms enable easy application and removal. Flexible, low-profile upright contours to the patients anatomy. Becker Orthopedics Model 2009 is a non-protrusion knee joint that combines the simplicity and security of a standard drop lock with automatic locking. When joints reach full extension, the rings are automatically engaged by springs that are internally housed within the midsection. This feature gives the user the convenience of automatic locking. Extra foam padding on the closure strap and upper eliminates pressure points. Non-binding elastic upper allows unrestricted stretch throughout the entire forefoot area. Seamless lining enhances comfort and offers unsurpassed protection. Hidden-depth design provides the appearance of stylish, normal-depth shoes. The shoes are made of synthetic, washable materials.